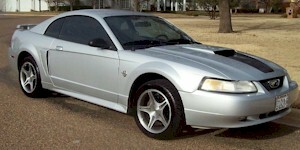 The Limited Edition 35th Anniversary 1999 Mustang GT was released with features available on the 2001 GT. These features included the 2001 raised hood scoop, side scoops and raised rear decklid spoiler. A total of 4,628 units were built. Of these, 2318 were coupes and 2310 were convertibles. They only came in red, black, silver, or white. They can be distinguished from normal GT by the raised hood scoop and internally by looking for the "35th Anniversary" logo on the instrument panel.